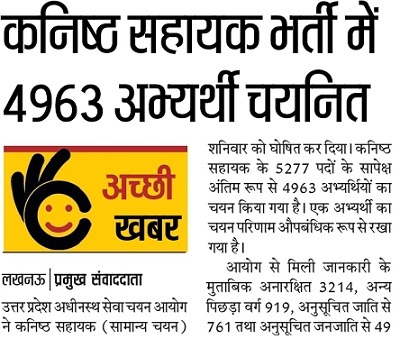 UPSSSC Junior Assistant Recruitment 2019 Latest Notification 6,000 Junior Assistant Vacancy in UP to apply online for 4,000 JA Vacancy News UP Junior Assistant Recruitment 2019. UPSSSC Junior Assistant Recruitment 2019 UPSSSC Board with all JA 6000 yet again Release the Junior Assistant Vacancy UPSSSC to apply online for UPSSSC Junior Assistant may visit below to get more updates on Uttar Pradesh SSSC Jobs of Junior Assistant Posts, Application Fees and Salary of Junior Govt jobs in Uttar Pradesh. 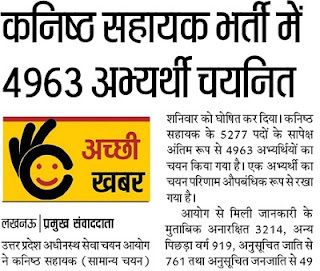 UPSSSC 6,000 Junior Assistant jobs is opening from January and candidates who wanted to apply in UPSSSC 6000 upcoming Junior assistant jobs they can apply soon from our link. 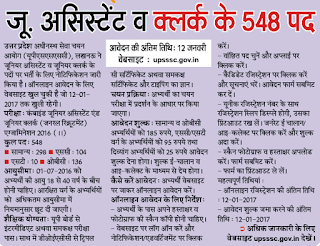 UPSSSC Junior Assistant Backlog Latest News: 314 posts is vacant after giving result of 4963 Junior Assistant on 13 October. Candidates who are selected get joining letter according to preference. 4,000 Junior Assistant Recruitment 2018: UP 4,000 After Completing all process on Junior Assistant related to Joining, Appointment letter. Another 4,000 vacancies is coming for Graduate pass candidates. Name of the Posts": Junior Assistant. Education Qualification for UPSSSC Recruitment: is must have passed Intermediate 12th pass with diploma related to Urdu Translator Anuvadak or equivalent from a recognized board or collegue. UP Junior Assistant must having the Hindi & English typing speed with 25 words per minute and also have the with DOEACC certificate. Applicant’s age limit must not be less than 18 years and not more than 40 years as on 01-07-2016. UPSSSC Junior Assistant Syllabus Junior Assistant Previous Papers: Multiple Type question Paper will come in Junior Assistant Written exam syllabus test you will be called Junior Assistant Interview and Typing test in English and Hindi. Name of Posts: Junior Assistant General: 00, OBC: 43, SC: 56 and ST: 16. Educational Qualification UPSSSC Clerk Vacancy 2017: Intermediate or Graduation Degree with DOEACC society CCC O, A, B or BCA MCA etc. Salary of Junior Assistant in UP: Depend on which department you get under Pay scale 5200-20200 grade pay Rs 2000. How to apply: Interest Candidates May Visit official website and Download details of Eligibility criteria, Experience, with supporting documents. Application Fees: For General and OBC: Rs. 185/-., For SC, ST: Rs. 95/- pay for PH Candidates: Rs. 25/-. Starting Dates of UPSSSC Jr Assistant Jobs is 18th January 2017. Last Dates of UPSSSC Asst Online Registration is 07th February 2017. Last Date for Submitting Application Fee is 20th January 2017. Closing Date for Submitting Fees is 09th February 2017. UKSSSC 1767 Junior Assistant Recruitment 2017: Uttarakhand Adhinsth sewa chayan ayog wants to recruit JA Lekhkar and other Group c vacancy. UPSSSC Junior Assistant Syllabus 2017 Question Paper: Objective Type Paper with Total 40 Marks and Total 80 Question will come with General Intelligence Test Called Reasoning, Maths, General Knowledge and Hindi Model Questions. Category wise junior assistant vacancy in UP: General 298, OBC: 136, SC: 104, and ST: 10 Posts, Freedom Fighter:04 Posts, Physically Handicapped:06 Posts, Ex Servicemen:14 Post, Female:97 Posts. Age Limit: As on 1 July 2016 Minimum 18 years to Maximum 40 years. Educational Qualification: 12th pass Intermediate With Computer Certificate(DOEACC, Degree,). Typing Speed of 25 wpm & 30 wpm in Hindi & English. Application Fee: Rs. 185/- for Gen & OBC and Rs. 95/- for SC/ ST. PWD have to Pay Rs. 25. How To apply for UPSSSC Junior Assistant Bharti 2017: Visit UPSSSC.GOV.IN to apply Online. Check all Eligibility Criteria, Age Limit, Qualification and Exam Syllabus for junior assistant latest recruitment. Last Date to Fill Registration Form: 12.01.2017. UP Junior Assistant Typing Test Result upsssc.gov.in Clerk ..
UPSSSC Junior Assistant Interview Final Result Merit List . UPSSSC Junior Assistant Joining Letter Document Date . 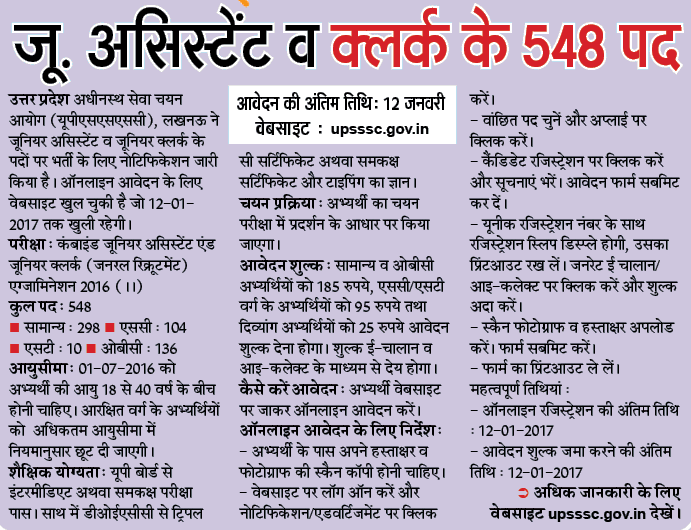 Those who want it up junior assistant may check official notification on and on category wise posts which is available at upsssc.gov.in. One who meets up these eligibility criteria with syllabus of UPSSSC Jr assistant may apply online. Requesting you to Bookmark sscbankgk.in by pressing both the ctrl+d. we will update Uttar Pradesh junior assistant Urdu Translator Anuvadak admit card in next updation details like question paper, syllabus, exam dates, results and answer keys in our Uttar Pradesh site regularly.